In 1977 the founder of Engage began his way in the jewellery industry by manufacturing jewellery for the masses. Forty years on his passion was re-ignited by his son to begin a new avenue of jewellery production. However, this time for the retail market. 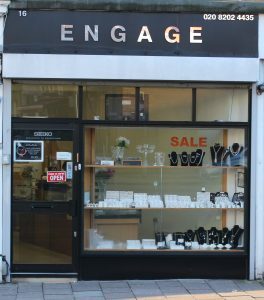 When Engage was set up in the suburbs of central London in 2012 the retail journey began, but with a twist. Using our knowledge and experience in the jewellery industry we could make custom- made jewellery affordable to everyone. Our fine blend of artisanal skills combined with modern-day technology like 3D printing, computer-aided design (CAD) and silicone RTV allows us to finish jewellery to a very high standard and to specialise in creating bespoke jewellery. Furthermore, our team of CAD designers, 3D printers, casters, gem-setters and finishers ensure that products are delivered in a quick turnaround. Additionally, all our wedding and engagement rings are manufactured and finished in the UK using materials from fair trade, which means you can be assured that the jewellery you wear is responsibly sourced. At Engage, we are passionate about jewellery which is why we want you to enjoy what we create. We encourage you to become involved in the process of designing your own jewellery so that you can revel in the knowledge that you had a vital part to play in the jewellery you wear. The personal and unique attention we give to each customer and our combination of traditional and modern jewellery techniques ensure that the jewellery we make is the jewellery you want. © 2018 GEMLINE DESIGNS LIMITED. All rights reserved. Company No 07945756 registered in 30 Shirehall Park, London, United Kingdom, NW4 2QL (this is not an address for returns).